Written in 2013 by Julia Rosen, this post explores what happened on November 18, 1929 when the underwater telegraph cables snapped. Today, a veritable superhighway of data rushes below the surface of the frigid North Atlantic. Every second, thousands of gigabytes whiz back and forth between North America and Europe on one of dozens of telecommunication cables that snake along the seafloor, transmitting emails, tweets, pictures, music — the everyday stuff of our digital lives. In fact, a physical line of communication has linked the two continents since the first telegraph cable spanned the ocean back in 1858 (it was capable of transmitting just a few words per hour, and that was still a big improvement over shipping letters across the sea!). In 1929, however, these telegraph cables did more than connect the world: through an accident of geologic happenstance, they helped scientists discover a whole new phenomenon known as a turbidity current. The route of the 1858 transatlantic telegraph cable. Source: Frank Leslie’s Illustrated Newspaper, August 21, 1858 (public domain). The Great Eastern, the ship which laid the first permanent cable in 1866. Source: Robert Edward Holloway (public domain). Like most of the early telegraph cables, the cables in question began in England and made landfall on the island of Newfoundland, off the east coast of Canada. They were made of insulated copper wire and were strung across the planet by large steam sailing ships like the Great Eastern. Where they approached land, the cables climbed up the continental slope, the band of steep underwater topography that occurs where the continental shelf gives way to the deep ocean. 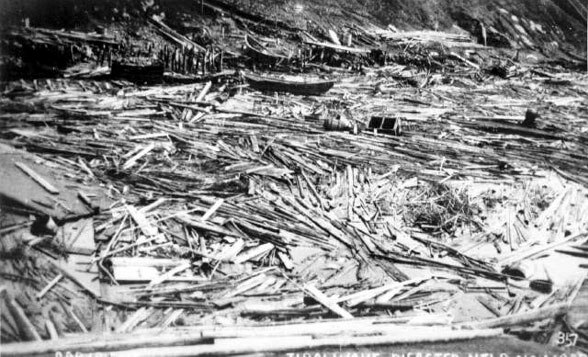 It was here on the continental slope that twelve cables were severed during a magnitude 7.2 earthquake that struck on November 18, 1929, 250 kilometers off the coast of Newfoundland under the plentiful fishing waters known as the Grand Banks. The earthquake caused a devastating tsunami that, in places, towered more than 13 meters high, wiping out entire villages, killing almost 30 people, and leaving many more stranded. Tsunami waves from the event were even reported as far as South Carolina and across the Atlantic in Portugal. 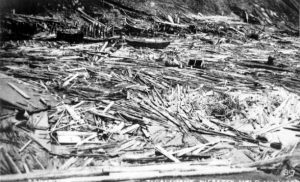 Destruction in Newfoundland following the Grand Banks tsunami. Source: Provincial archives, Newfoundland Labrador Department of Natural Resources. As the telegraph companies slowly began to take stock of the damages in the wake of the disaster, scientists blamed the destruction of the cables on underwater fault movement from the quake itself or on the powerful tsunami. At the time, there were few tools to study what might have happened hundreds of meters below the surface, so these conjectures were mostly based on theory. However, one seemingly inconsequential detail held the clue to the truth: from records of when they lost communication, the telegraph companies reported that six of the cables broke immediately at the time of the earthquake, but the remaining cables broke sequentially, and at progressively deeper depths, over the next 13 hours. Oddly, none of the cables lying higher up on the shallow continental shelf were damaged. All of the explanations offered at the time struggled to explain this slow, regular pattern of breakage, leaving some scientists with a nagging feeling that they were missing something. Independently of the Grand Banks earthquake, a few geologists and oceanographers in the 1930s had begun to hypothesize about the possibility of underwater avalanches. In particular, a scientist named Reginald Daly from Harvard University suggested in 1936 that slurries of sediment and water might develop on the continental shelf, and since they would be heavier than the “clean water” around them, they could accelerate and flow down the continental slope. He dubbed these debris flows “turbidity currents” and argued that they could have carved steep submarine gorges that dissect the continental slope, features which were revealed by seafloor mapping expeditions just a few years before. Unfortunately, Daly lacked any evidence that ocean turbidity currents were real and for the next twenty years, geologists continued to debate their existence, using theoretical predictions and laboratory experiments to support their arguments. It wasn’t until 1952 that two scientists — Bruce Heezen and Maurice Ewing of Columbia University — put all the pieces of the puzzle together. They were aware of Daly’s turbidity hypothesis, still untested, when at last, they realized that the Grand Banks cable breaks provided the first proof of a turbidity current in action: an underwater debris flow careening down the continental slope at the speed of an automobile would produce exactly the observed pattern of cable breaks and spare those on the continental shelf. They proposed that earthquakes could be a common trigger for turbidity currents, a fact we now know to be true. 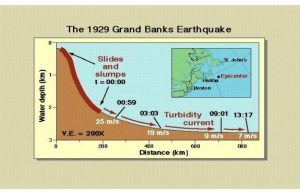 Heezen and Ewing’s explanation for the 1929 event has now been universally accepted, and the Grand Banks telegraph cables are credited with documenting the first turbidity current ever observed by humans. After decades of further research, scientists now know that the turbidity current caused by the Grand Banks earthquake carried more than 200 cubic kilometers of debris more than 1,100 kilometers, depositing it across vast areas of the deep ocean — the cables didn’t stand a chance. Scientists also know that turbidity currents like these are common along geologically active margins like the Northwest Coast of North America and Japan. The unique type of debris they deposit can even be used to understand past tectonic histories of plate margins by providing geologic evidence of ancient earthquakes. And as Daly suspected, turbidity currents have proved to be a crucial part of how submarine canyons form. We owe all this understanding to a simple coincidence: that some copper telegraph cables were in the right place at the right time when disaster struck 84 years ago this week. Learn how discoveries like this are part of how science works in our module on the Practice of Science and in this article about submarine canyons at Wired.com. Watch this PBS special on the first Transatlantic Cables. Learn more about how turbidity currents work at NOAA.gov. Julia Rosen is a freelance science writer and PhD student at Oregon State University. She received a Bachelors degree in Geological and Environmental Sciences from Stanford University before beginning her doctoral research on polar ice cores and climate change. In between, she did her Master's in backpacking around the world and skiing. Julia is a periodic contributor to Oregon States research magazine, Terra, and helps write blog content and develop learning modules for Visionlearning.